Don't let your heater smolder overnight – keep enough air in the fire to maintain a flame. If you are buying a wood heater, make sure it has a compliance plate showing it meets the Australian Standard (AS/NZS 4013:1999). Council has a factsheet to assist wood heater operators and the neighbours in understanding the legal obligations of operating a wood heater, a copy of the factsheet can be obtained here. More detailed information is available from the Wood-Smoke handbook: Wood heaters, firewood and operator practice on the Department of Sustainability, Environment, Water, Population and Communities website. You can visit it here. Wood heater ownership is on the rise in NSW. It is expected that, as gas and electricity prices rise, more people will install wood burning heaters. Homeowners are required by law to obtain permission from Council before installing a wood burning heater. If you would like to install a wood burning heater, you can fill in the application form or contact Council’s Customer Service team on (02) 6499 2222. Problems with smoke from a neighbour’s wood heater? 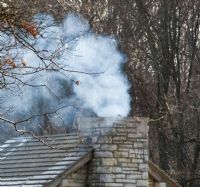 If you have difficulties with wood smoke pollution from a neighbour, let them know. Often people don’t realise that their fire is producing excessive smoke, because they are inside enjoying the warmth of their wood fire. For more information contact the Environment Protection Authority on 131 555 or visit their website, or call Council's Customer Service team on (02) 6499 2222, as Council staff may be able to assist you. Council has introduced controls related to burning vegetation and other matter in the open. Under the POEO (Clean Air) Regulations 2010 anyone burning in the open in the Bega Valley Shire must comply with Council’s Clean Air Procedure, You view a copy of the procedure here. Should you require Council approval to burn vegetation you can fill in the application form or contact Council's Customer Service team on (02) 6499 2222.